At 23’2” length overall on an 8’6” beam, the 230 vantage is rated to accommodate ten persons maximum capacity. 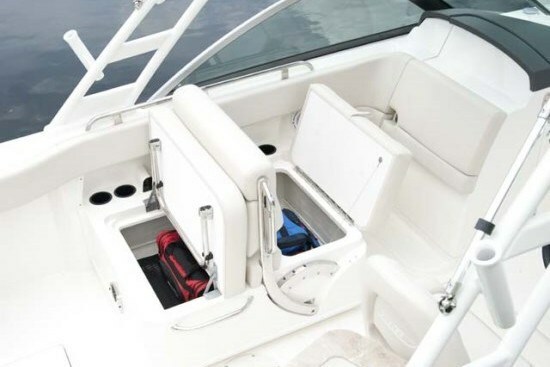 A double-wide stern seat with padded backrest folds up neatly into the transom when not in use. A “convertible portside lounge seat, which folds into a variety of positions so that passengers can ride facing fore or aft, partially or fully reclined, or even use it as a leaning post for offshore fishing.” A padded bolster on the portside head compartment door acts as a backrest for this seat when it is in the fully reclined lounge position. 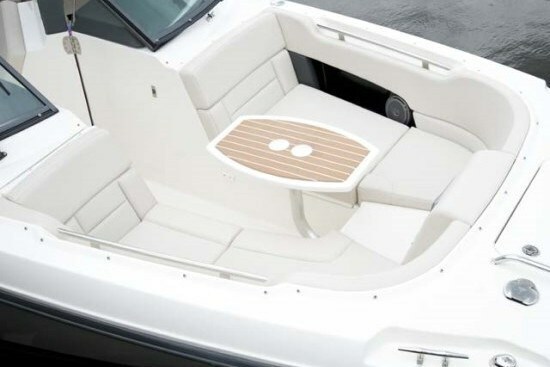 This seat contains storage below and an optional table may be mounted on its rear face between it and the stern seat. This same table may be mounted in the U-shaped bow seating area which has full surround padded backrests, including on the front of both consoles and storage below the cushions. Optional filler cushions convert this bow area into a sunlounge. Up here are four drinkholders, grab rails, a 12-Volt receptacle, and a bow walk-thru blockoff panel. An anchor locker with lid is immediately forward. Cockpit courtesy lights are dual colour, blue and white. 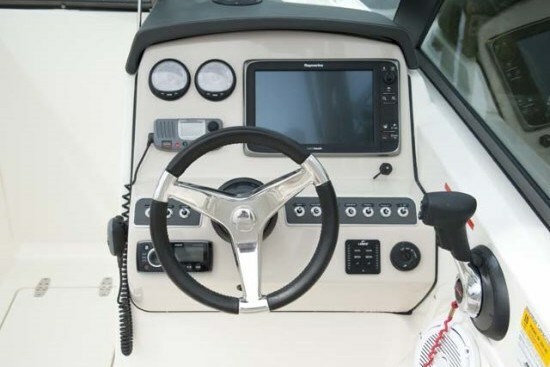 The driver’s side helm console standard equipment features a cast stainless steel tilt steering wheel with urethane grip, a dash visor, compass, two drinkholders, storage, starboard side windshield wiper, built-in footrest, Mercury® DTS (Digital Throttle and Shift) binnacle control, SmartCraft deluxe gauge package, controls for the recessed electric trim tabs with indicators, and a large area for mounting your choice of electronics. 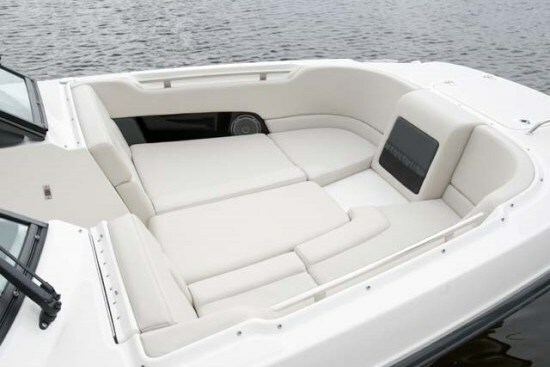 No less than four Raymarine 9” or 12” electronics/navigation packages are available to fill this space, a Raymarine VHF radio plus a satellite marine weather receiver if you so-choose. A custom swivel, adjustable helm seat with high/low pedestal is provided. The passenger console/enclosed head compartment on the 230 Vantage is unique in that it is wider than the driver’s console so that the “centre” walk-thru is actually not centre at all, but slightly right of centre giving more room to the head compartment. The hinged, lockable entry door with dash visor leads to a molded interior with molded sink and standard portable head with pumpout. An optional freshwater system provides a retractable shower sprayer here as well as both bow and stern sprayers and one in the cockpit utility center. 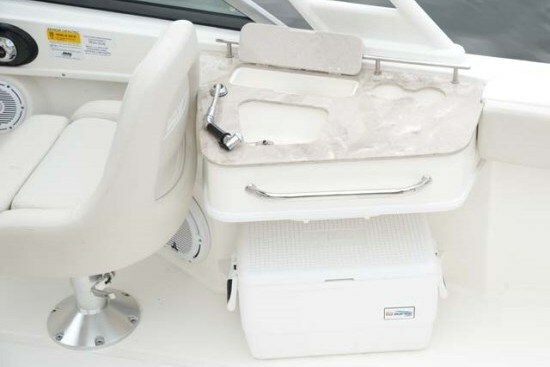 This center, located behind the helm seat includes sink, cutting board, and 36-quart portable cooler. Let’s investigate some of the other notable options available for the 230 Vantage that allow you to personalize your boat for your intended uses. 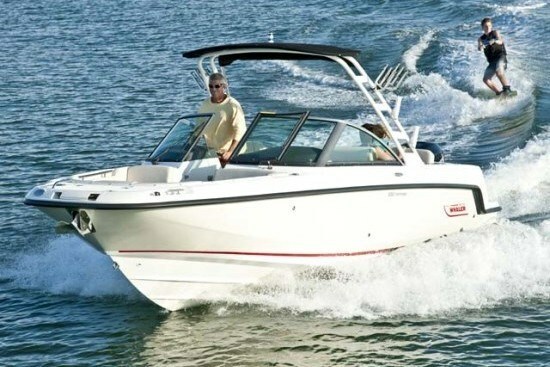 Standard power is provided by a 225XL L6 DTS Mercury FourStroke Verado® with power steering. 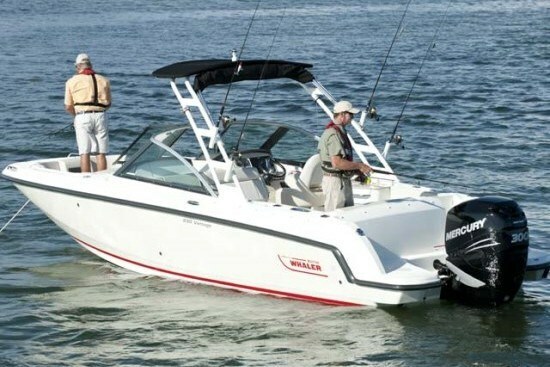 With this engine, Boston Whaler reports optimum cruising speed to be 28.6 mph at 4500 RPM consuming 10.6 (US) gallons per hour and a range of 270 miles. Wide Open Throttle (WOT) at 6300 RPM produces 42.3 mph. If this is not enough, move up to the 250 or 300 horsepower choices available. For watersports, a tow arch or an aluminum Water Sports Tower is available with or without wakeboard racks and tower mounted speakers, themselves requiring the premium audio package over and above the optional Fusion® stereo package. A Fishing Package includes a 14-gallon lighted livewell, fishing station, raw water washdown, and extra rod holders. An aluminum trailer is also available as is a bow mounted beach boarding ladder, air compressor, anchor windlass, and an assortment of canvas covers, bimini top, up to a complete enclosure.